It’s been a busy few weeks for me. So busy, in fact, that on days where I find myself with nothing going on, I fall asleep by 8:30 in the evening. Turns out I’m feeling a bit like jello and have turned into an angry beast without any rest. I place some of the blame on out of place ribs, too. But that’s a whole other story. Not only have we had lots of derby trips, but I’ve been experiencing some of the most intense practices in existence because we’re headed off to the South Central Regional Tournament in Lincoln, NE October 5-7. 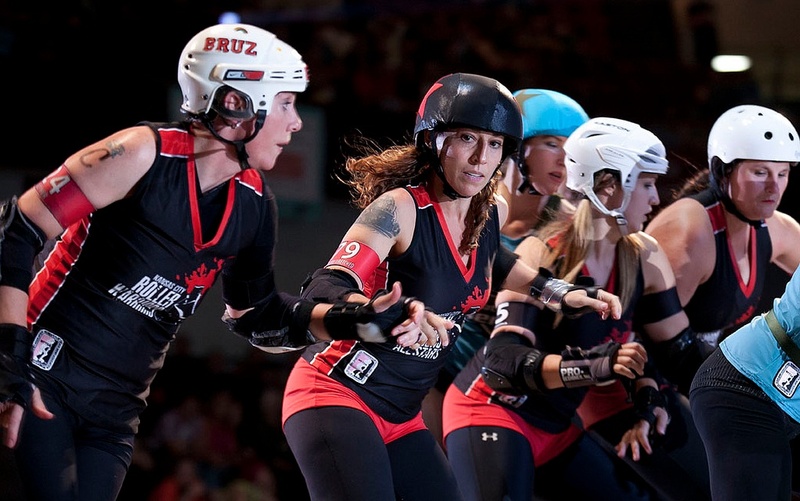 Last year, I sat on the sidelines as a new transfer skater to the Kansas City Roller Warriors. After spending my 2011 season on the B-team in Springfield and allowing my collarbone to heal, I was keeping my fingers crossed that I would make Plan B. And all I could do during the 2011 tournament was sit in awe of the women who would soon be my teammates — and teammates on the ALL STAR team, might I add — as they played in Municipal Auditorium against other top-rated teams. So to think I will be sporting that same jersey this year boggles my mind. These are just some of my blockers. Bruz-Her, Trauma, and Evolution. SWOOOON! I’ve grown so much since then. And the more I sit and watch the other regional tournaments, the more I’m blown away to see girls I’ve gotten lead jammer over headed off to nationals. It’s unbelievable! I’m already dying for next season, where I’m the captain of the Knockouts and teaming up with the incredible Toxic Assets as my co. And I’m anxious to see what I can accomplish by this time next year. In my spare time, I’m taking a class at the University of Kansas and considering gearing up for a half marathon. I’m also hopeful for nationals in Atlanta, plus it seems like a trip to New York might fit in there somewhere too. But don’t worry about me. If the great movie Roadhouse taught me anything, it’s that I’ll sleep when I’m dead.